The Hairouna Film Festival (HHF) kicks off tonight at the Calliaqua Playing Field. Three films will be shown, “Black Doll” by Vincentian Akley Olton, “Flight” by Jamaicans Kia Moses and Adrian McDonald and “Bad Lucky Goat” (feature length comedy) by Samir Oliveros from Old Providence. 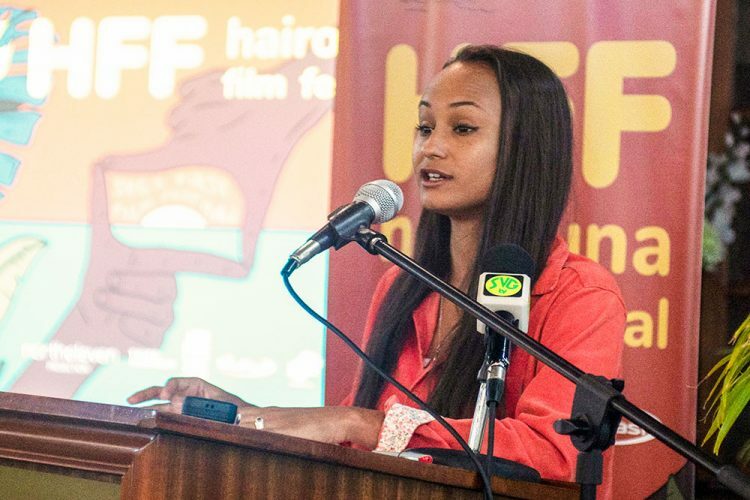 Festival Director Aiko Roudette, speaking about the HFF during the launch last week said that the festival comes at a very exciting moment for Caribbean film. She noted that this is the first time that a film festival of this nature is being held in SVG and it comes at a time when more and more films are coming out of the Caribbean and the standard of work across the region is rapidly improving. The festival continues tomorrow, Saturday March 23 at the Calliaqua Playing Field and is dedicated purely to Vincentian talent. Films to be shown are from Shadique Gill, Colin Brown, Alex Barnwell and Lesroy Arthur of Fross Films, Tolga Akcayli, Javed DaSouza, Camillo Edwards, Akley Olton, Nadia Huggins, the Hub Collective in Bequia, Eniye Kagbala, Troy Olliviere, Camp Innovate iT and Aiko Roudette. On Sunday, March 24 the festival moves to the community of Redemption Sharpes where a short documentary by Jadiel Foster, an art student at the St Vincent and the Grenadines Community College (SVGCC) and a member of the Sharpes community will be shown. This is Jadiel’s first film. The film will hear from residents of Sharpes who give their opinions on the crime rate in their community. This will be followed by a program of short films from around the Caribbean, as well as “Breaking the Cycle”, a Trinidadian feature documentary that tells the story of a survivor of domestic violence. On Monday March 25, the SVGCC, Villa Campus will see a series of short films that focus primarily on issues faced by contemporary Caribbean youth. On Tuesday March 26, a special screening for the inmates at the Belle Isle Correctional Facility will be done. A feature length documentary called “Songs of Redemption”, which is set in a prison in Kingston, Jamaica is the film of choice. On Thursday March 28 the HRR will visit the village of Barrouallie, where it will present a collection of Caribbean shorts including a short film called “The Deliverer”, which is about the struggles of a fisherman who is trying to save his village from a corrupt government. On Friday March 29, Sandy Bay is the venue where a special screening of Colin Brown’s “The Resurrect”, a short documentary featuring our own indigenous Kalinago chief, Augustine ‘Sardo’ Sutherland will be shown. The week of screenings culminates on Saturday March 30 at FLOWT beach bar, where there will be a special screening of Caribbean shorts not previously shown during the week, including a screening of a work in progress by Akley Olton called “Hairouna, Land of the Blessed”. This screening will contain subject matter and language that is not suitable for minors. Roudette said that this year, they have chosen the format of free community screenings because they want the benefits of the film festival to be accessible to as many Vincentians as possible. “We thought that these benefits outweighed the many additional financial and technical challenges that open-air screenings involve, which are numerous. The films that we are showing have been specifically chosen with each community in mind,” Roudette said. She added that many of these films are carving a place for Caribbean cinema on a global stage leading to an increasing demand for diverse Caribbean films. “We are at the beginning of an incredible new cultural movement, and this festival wants St Vincent and the Grenadines and Vincentian creative visionaries to be a part of that movement. We see an opportunity here, for our creative sector and for our national economy, to benefit from St Vincent’s inclusion in this movement,” Roudette added. She noted also that the cultural and economic value of film festivals has been proven time and time again.